Being an early starter, Russ was already drumming at the age of 9. By the time he was 12 years old he was in his first band with older kids. One of them was a big Genesis fan and lent him the “Seconds Out” album. It was love at first listen and Russ set about trying to learn “Squonk”, “Dance on a Volcano” and many others on his trusty Gretsch copy drum kit. He distinctly remembers recording the Radio 1 live broadcast of the Genesis Knebworth Concert on the radio to cassette. His first experience of Genesis live was in the early 80’s on the Duke tour, then also the Abacab tour and the 2007 Reunion. Russ has been lucky enough to meet Phil Collins & Steve Hackett, and to have had drum lessons with Bill Bruford. 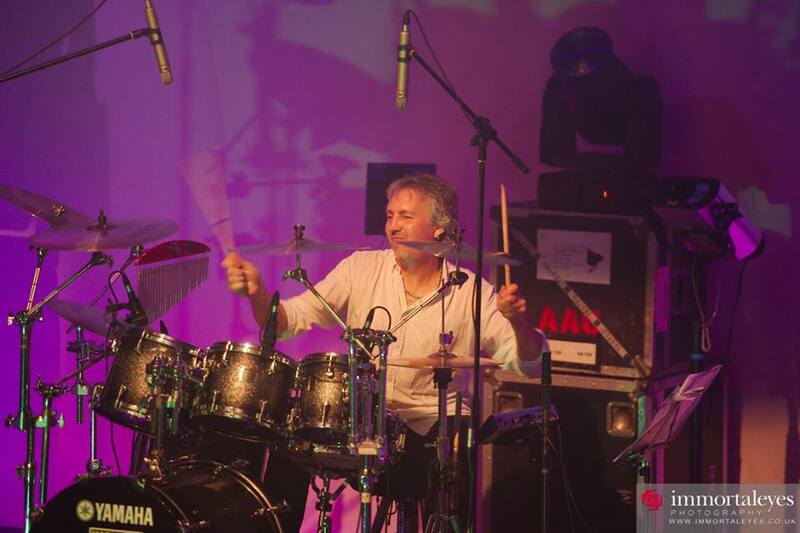 Russ favours Yamaha drums (Absolute Series) and has a choice of four different kits, depending on what mood he is in! The sizes he uses are generally 8”,10”,12”,13”,14” & 16” toms, a 22” bass drum and a 14” x 5.5” wood shell snare drum. He also recently restored two Vintage Premier kits, both Collins replicas. One of these we hope to use at future GVT gigs – the 1981 Premier Soundwave Duke Tour Replica. Russ has an endorsement deal with Istanbul Mehmet cymbals and plays the Radiant & Session ranges – 14” Radiant Medium Hi-Hats, 15”, 16” & 17” Radiant Medium Thin Crashes, 18” Session China, 20” Radiant Medium Ride or 20” Session Ride. Russ is an avid endorsee of Hardcase drum cases, The Kelly SHU bass drum Mic mount and Baskey Rugg Luggs & Drum Rugs.He uses Pro Mark 747 Nylon tip drumsticks.There are also various electronic gadgets likely to be called upon for this show including – Alesis Samplepad, Roland TM-2 Trigger Module and various vintage Simmons Modules and electronic drum pads. Russ was a professional musician in the early to mid 80’s before moving to an IT career for nearly 20 years. Rediscovering his true vocation, Russ took voluntary redundancy in 2002 and became a professional drummer (again) and drum teacher. In the last 16 years he has worked for 10 of those with the Yes Tribute “Fragile”, also “Led Zep Too”, “The Purple Project” and more recently “Ultimate Elton and The Rocket Band”. With this band he has toured India, been on four Royal Caribbean Cruises, played to 20,000 people at Carfest North, appeared at Elton John’s Mum’s 90th Birthday Party and played live to an audience of 10 Million people on ITV’s “This Morning”. In the last couple of years Russ has rekindled his love of Genesis music, particularly with “The Book of Genesis”, playing Gabriel era material, and working on double drumming shows with them. Russ has also been Owen Paul’s drummer for the last six years, Owen is best known for his 1986 hit “My Favourite Waste of Time”.